At some point, every woman begins to notice that her once plump and supple skin has turned saggy and “bumpy”. Sometimes, it is enough to go on a healthy diet and start exercising to whip yourself back into shape and make the dreaded cellulite go away. But if nothing seems to work, and you cannot shake the impression that your hips look like they have been hit by a hail storm, it might be time to invest into a good cellulite reduction treatment. And we are not talking about expensive creams, scrubs, and lotions that promise a lot but don’t deliver. We are talking about innovative shockwave therapy that actually brings results! Cellulite is a term that describes dimples and lumps in the skin. They occur when the collagen production decreases, and the skin loses its natural elasticity. Sagging causes fat cells under the skin to bulge and look more pronounced. Enlarged fat cells restrict the blood flow which results in poor circulation. This leads to even more fat cell clusters forming under the skin. As the skin gets thinner with age, losing more and more collagen, the “bumps” get more visible, causing women to become extremely self-conscious about their image. If you are currently battling “orange peel” yourself, don’t worry! You are not alone: 80 to 90% of women face this problem at some point in their lives. What you can do for cellulite reduction on hips? First of all, stop wasting money on ineffective anti-cellulite creams, body wraps, and compression gear! For a long time, liposuction was the only effective solution, but those days are gone. There is a new cellulite reduction treatment on the market that can help bring smooth appearance to your cottage-cheese skin without surgical invasion. Shockwave therapy refers to acoustic waves that cause micro-tears in the connective tissue, breaking down cellulite. The body automatically increases the amount of collagen to heal the affected areas. As a result, you get firm, smooth, and lifted skin. Shockwave therapy is an excellent extracorporeal method of cellulite reduction on hips and buttocks. The handheld device helps target the acoustic shock waves directly at enlarged fat cells to make sure they hit your problem areas. 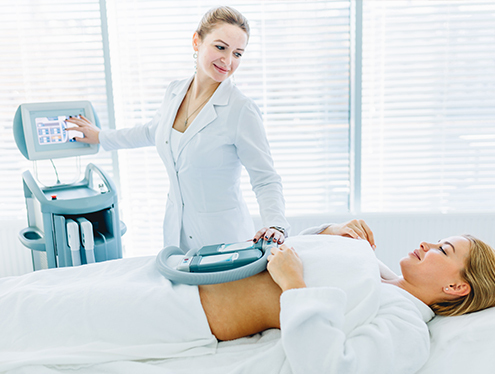 The shockwave cellulite reduction cost depends on the stage of your condition and the size of the affected area. Please note that it is recommended to complete 8-10 treatments to see noticeable results. Iuventus medical center offers shockwave therapy treatments at reasonable prices that won’t drain your budget. Make an appointment today to achieve cellulite reduction on hips and buttocks in the shortest time! If you have any questions about our services or prices, don’t hesitate to contact us. Our working hours are Monday through Friday 9 a.m. to 5 p.m., and Saturday 8 a.m. to 12 p.m. Go through our innovative cellulite reduction treatment and say goodbye to unsightly “orange peel” forever!